I was cursing the high-season traffic along Florida’s Gulf Coast until we made a right turn off grid-locked Cape Coral onto Pine Island. Then I remembered the travel truism: The best places are usually the hardest to get to. The Tarpon Lodge in Pineland, Florida is a perfect example. No franchise stores. Check and double check. Pine Island means many things to different people — a haven for fishermen, a laid back Gulf Coast community for Boomer artists, and a plantation-style town whose natural beauty and abundant sea life hasn’t much changed in 100 years, inspiring artists and musicians who visit to decide to settle there. The place has a way of rubbing off on you. The secret sauce is happiness. Residents, mostly empty-nester snowbirds fleeing the Northeast cold or Pacific Northwest damp, are happy to be here and want you to share in it too. It’s a place where gray is the new blonde; where golf carts and fat tire bikes have kicked the Prius to the curb; and where Airstreams house visiting grandchildren. At about 18 miles long and 6 miles wide, Pine Island is the largest of the channel islands separating the mainland from the better-known Sanibel Island, whose beautiful white sand beaches are famous for seashells. Pine Island is laced with canals overgrown with mangrove and sea grass which attract diverse species of fish, shellfish, dolphins and manatees. It is verdant with palm tree plantations and tropical plant and fruit nurseries. The locus communities are St. James City on the south tip, Bokeelia on the north tip and Pineland in the center. Be on the lookout for American bald eagles soaring above; Pine Islanders have recorded 18 nests. Ribbed by old-school electrical poles now adorned with psychedelic colors, Stringfellow is the main north-south road and Pine Island Road the east-west one. 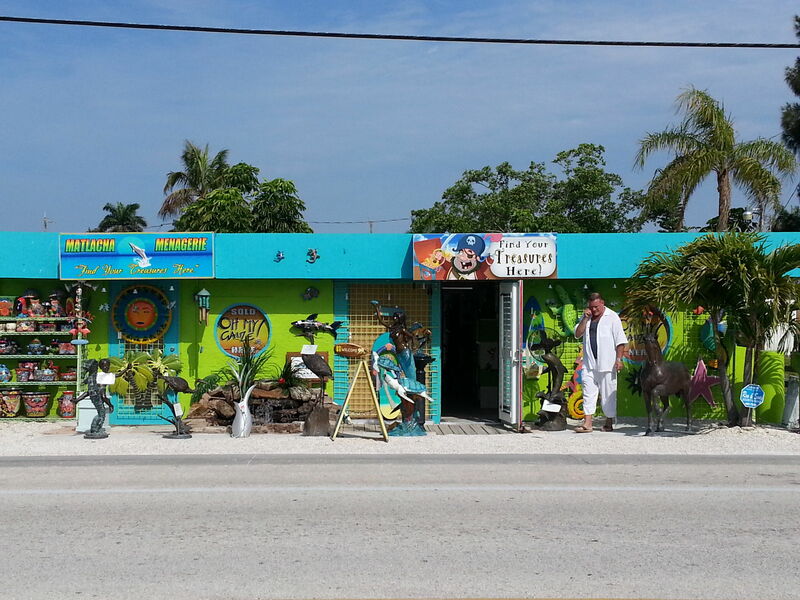 The charming artist colony of Matlacha (pronounced with real French flair as MAT-lah-shay) is its own small island between Cape Coral and the eastern side of Pine Island. Our family base was the Tarpon Lodge on the outskirts of Bokeelia. Built in the 1920s as the Wilson family fishing lodge, it has survived many high and low tides along with Hurricane Charlie in 2004. The landmarked white clapboard Historic Lodge houses a terrific restaurant (Michelin-level great), cozy bar decorated with prize tarpon (stuffed), and eight guestrooms upstairs. The second structure, Island House, rises on stilts from the lawn, with half of its 12 rooms admiring the sweeping lawn, pool and marina (room 3 is a favorite) and the other half overlooking the back garden and neighboring cottages of the Palamar Bible School. Some of the clean and tidy rooms have balconies, some have mini-fridges, others connecting doors and all have free WiFi and ensuite bathrooms with tubs and showers. From the rattan sofas and piles of magazines in the hallway to the complimentary morning `snack’ (with all the fixings) of bagels, cereal, yogurt, fresh fruit, tea and coffee — Tarpon Lodge is a rustically high class B&B that feels like grandma’s house, if your grandmother is a great cook and super housekeeper. For fried fish among the fish folk, it’s hard to top Woody’s (239/283-5555) at 3051 Stringfellow Road in St. James City. Locals arrive via small powerboats along the canal, by bike or by car for the classic rock and fresh, inexpensive food. When the fried clams are in they’re our first pick, although the conch fritters were nice and light and the dipping sauce extra tangy. Don’t skip a chance to watch Ingeborg at work at The Potter’s Workshop across the street. The Waterfront (239/283-0592), just a few lanes away at 2131 Oleander Street on the island’s southern tip, is equally praised – let us know what you think. Reds Seafood House and Tavern (239/283-4412), at 10880 Stringfellow near the island’s four-way stop sign, has no view, but it’s liked for its variety of seafood. What we noticed was the rock bottom pricing for Happy Hour, the time of day when the parking lot was most crowded. It’s popular with families for early suppers, too. A really fun place for lunch or sunset is The Old Fishhouse (239/282-9577) at 4530 Pine Island Road NW in Matlacha, right on the water where the river meets a canal. There’s free live music, great fish po’boy sandwiches and a really fun crowd. If the kids get restless watching you slurp fresh clams, they can go out to the deck and feed the pelicans. You don’t have to be a Beatles fan to enjoy the Lovegrove Gallery & Gardens (239/282-1244), located at 4637 Pine Island Road Matlacha, FL 33993, but it helps. The trippy style of local celebrity artist Leoma Lovegrove –- both personally and in her work -– delights the senses. Vivid color canvases of fish, rock stars, island landscapes and more explode the walls of this small gallery to land on bags, T shirts, mugs and other items sold here and in the state’s Bealls department stores. 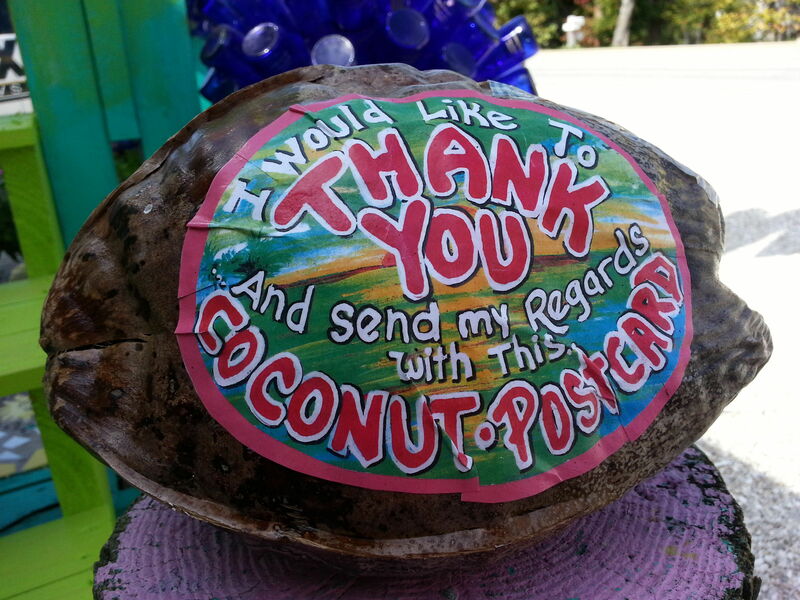 Ms. Lovegrove is known for the painted coconut postcards that can be mailed at the local U.S. Post Office with its under-the-sea mural. 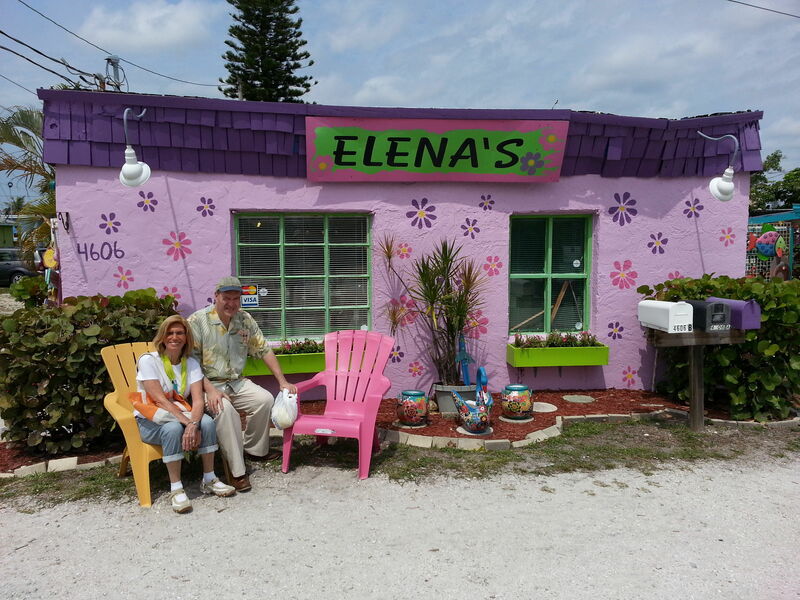 We love that she gives art classes in the back garden to all ages, and that visitors can paint their own coconuts. A graduate of the renowned Ringling School of Art in Sarasota, Lovegrove has done portraits for Sir Richard Branson and President Jimmy Carter among many others, and created an ornament for the White House Christmas tree. If you’re driven to do something else, there’s fishing, eating fish and watching fish. Mainly there’s hanging out, drifting in and out of the many galleries, pottery workshops, vintage shops, and clothing boutiques clustered in these tiny towns. Slow down and talk to locals; each story of how they landed on Pine Island is fascinating. One woman confided to us why she chose it: “There’s no beach, that’s why there are no crazies here… just us folks.” Translation? Pine Island is immune to Spring Break. If you prefer to schedule your time, pick out one of these activities and spend the day with it. We guarantee by day three you won’t be planning anything. The Calusa Heritage Trail at the Randell Research Center is directly across the lane from the Tarpon Lodge. Follow the annotated walking path (parts are wheelchair accessible) around several overgrown shell mounds. These remains of a Calusa Indian village from 1500 years ago illustrate the culture of people who survived Ponce de Leon’s arrival and lived on island till the mid-18th century. The tiny Museum of the Islands in Bokeelia is another of this timeless island’s historic attractions. Vino’s Picasso (239/288-6953) runs casual art classes for all ages and the aged; BYOB or wine, some hors d’oeuvres and join their painting sessions taught by the local artists of Matlacha. At the Mel Meo Studio in Bokeelia (239/283-0236), you can try a two-hour art class for just $25 with all supplies included. Fun girls night out for sure. Great Licks Ice Cream Shop (239/282-2802) in Matlacha is run by the bronzed BJ Hickey, who kept us waiting for a cone while he flirted with a woman in the parking lot. Try the coconut ice cream, homemade right there and yummy. We liked talking to Captain Jack Boat Tours (239/222-9886 or 239/994-2572), one of the many local outfits offering both fishing charters ($275 for three passengers, $75 per passenger more up to six in the boat for a four-hour trip) and tours. 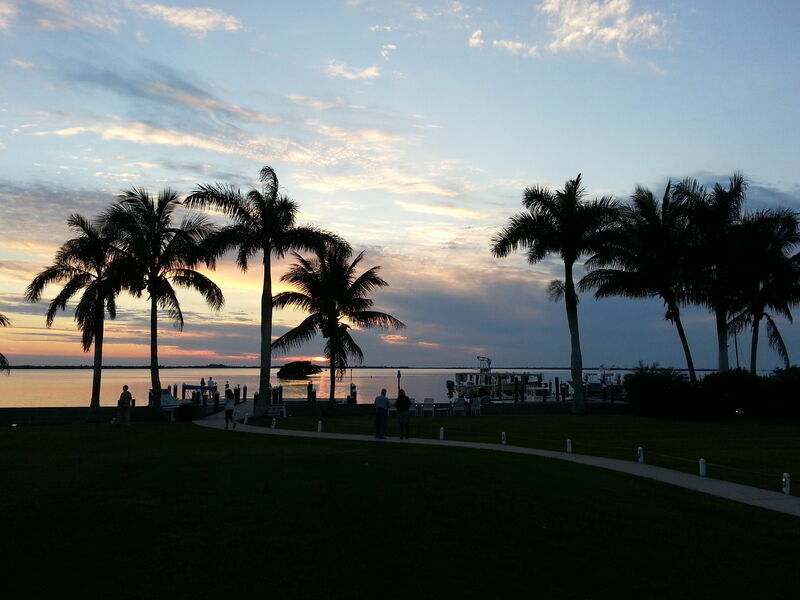 The variety of sunset and eco-tours include custom ones to see dolphins, or tour the Outer Islands such as Boca Grande, Cayo Costa State Park, Cabbage Key and North Captiva. (5.5 hours for up to 6 people costs $350.) Their popular, two-hour Back Bay Eco Tour leaves from Matlacha a few times per day and costs $35 per person. The Tarpon Lodge recommends Island Girl Charters and several others for daytrips out on the water, with guided excursions to Cabbage Key (their sister property) — the water is where you want to be. The Tarpon Lodge (239/283-3999) is located on the waterfront at 13771 Waterfront Drive, Bokeelia, FL 33922. Room rates range from $110 to $190 per night for two including breakfast, depending on season. Weekend rates are higher. There’s a freestanding one-bedroom cottage and two-bedroom boathouse which rent from $230 to $335; families will be comfortable with kids in the connecting queen and twin bedded rooms in Island Lodge too. For more information about the region and attractions in nearby Cape Coral, Ft. Myers, Sanibel, Captiva and Marco Islands, visit the Lee County Florida Tourism office site.